More than 28,000 visitors explored the University of Melbourne on Open Day – many casting a close eye over the School of Biomedical Sciences. 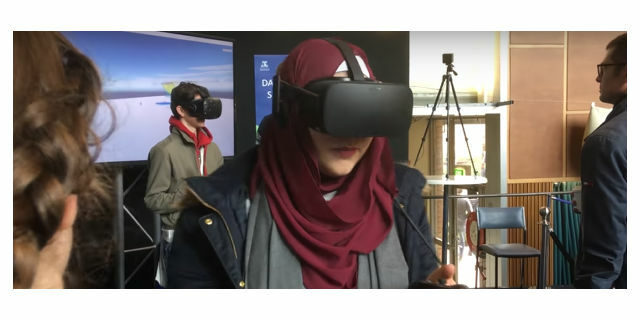 Prospective biomed students experienced life in our laboratories and trialled physiology’s Virtual Reality Learning Studio on Sunday 19 August. For the first time, SBS invited Open Day visitors into the labs where they could use the microscopes and explore existing experiments first-hand. Information sessions and student panels allowed visitors to understand more about the study pathways available as part of a Bachelor of Biomedicine. Student volunteers Saed Fahd and Gabriel Lirios also answered questions about their experience in studying stem cells, and what university life is like. The Centre for Stem Cell Systems was popular with prospective students and their families. Teaching Fellow, Dr Rosa McCarty, outlined the incredible stem cell research University of Melbourne scientists are working on and how it impacts patients and the broader community. To find out more visit The University of Melbourne 2018 Open Day.